I am a big big big fan of fake tan! I have used nearly every brand ranging from Rimmel to Fake Bake but I always go back to the St. Moriz medium shade. Mainly because of the price, which I get from home bargains (for those in the UK) for £2.99 which to me is such a good bargain for the quality and effect you get from this. First off the tan gives me a nice natural tan and not orangey at all (I've found). I normally just apply one coat for a natural looking tan but you can double up coats depending on your preferences i.e. night out. I have found that if you don't use it with a moisturiser then the tan can fade in an unpleasant way; for example patches in dry areas of the skin can occur. However I have also found this to be the case when using other brands e.g. the more expensive ones. This could be why people stay away from fake tan due to not liking the wearing affect or they think that buying the more expensive brands it's less likely to happen. So I recommend moisturising after showers as the fake tan fades gradually and naturally. Overall I've found this fake tan to be a great product. It's suitable if you are not wanting to spend too much but are also looking for a good quality tan. But remember with any tanning process moisturising is the key to a natural looking tan and exfoliate before hand. Let me know if you found this review useful or if you have any Fake Tan tips at @emilyhan1394 or in the comments. I would love to hear from you guys..
one for playing games? bang bang you're dead! 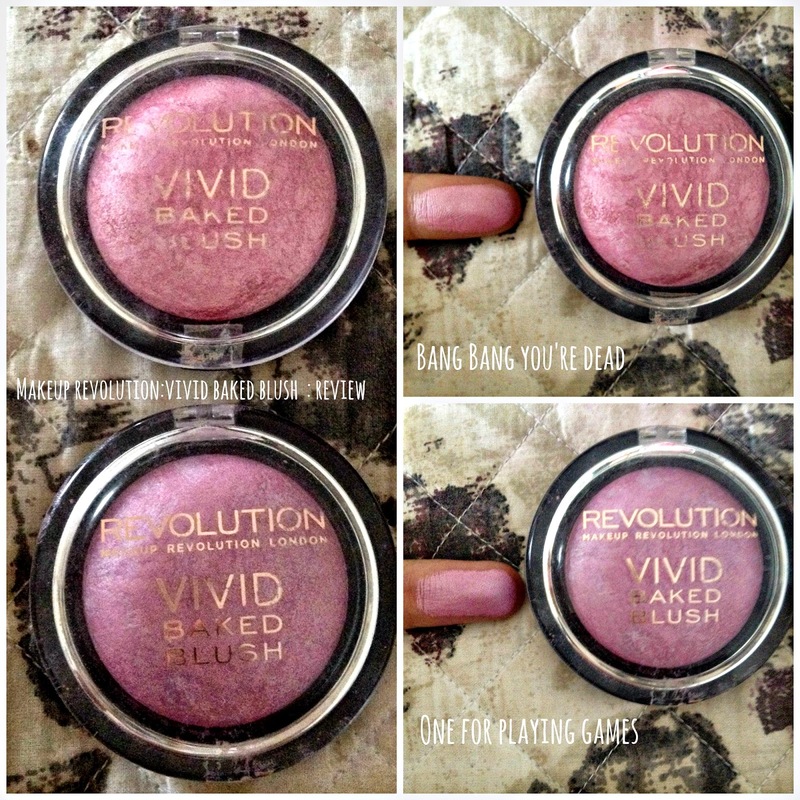 A few weeks ago I bought a few products from makeup revolution (see here) and two of them were these vivid baked blusher which cost £2.50 bargain! So since I've had them for awhile I thought it was about time that I let you guys know what I think of them. Ok.. i'm going to say it I love the name.. along with the price. It is a baby pink colour along with streaks of darker pink as shown in the swatch above. The pigmentation is great for the product as it can be easily built up and I'm super happy with it. Let me also say I found it lightweight on my skin and no to heavy..bonus! Now if I'm honest I haven't been going out of my way to wear it.. so I'm not extremely in love with it but it is nice to have in my collection. It gives a nice blushed effect to my cheeks after a bit of blending. I rate this product an 8.5/10 as for the price you can't go wrong! Again I love the name (easily pleased with a product with good naming me). I bought this blusher as I hadn't really tried a lilac tone blusher before. From buying this I learnt not to put it on the apples of my cheeks more to use when I contour as it personally doesn't suit me that much (on my apples). However saying this I am happy that I have this product in my collection and will use it in the future though it will not be everyday. Like bang bang you're dead it gives off a good pigmentation and is light weight. I rate this 8/10! 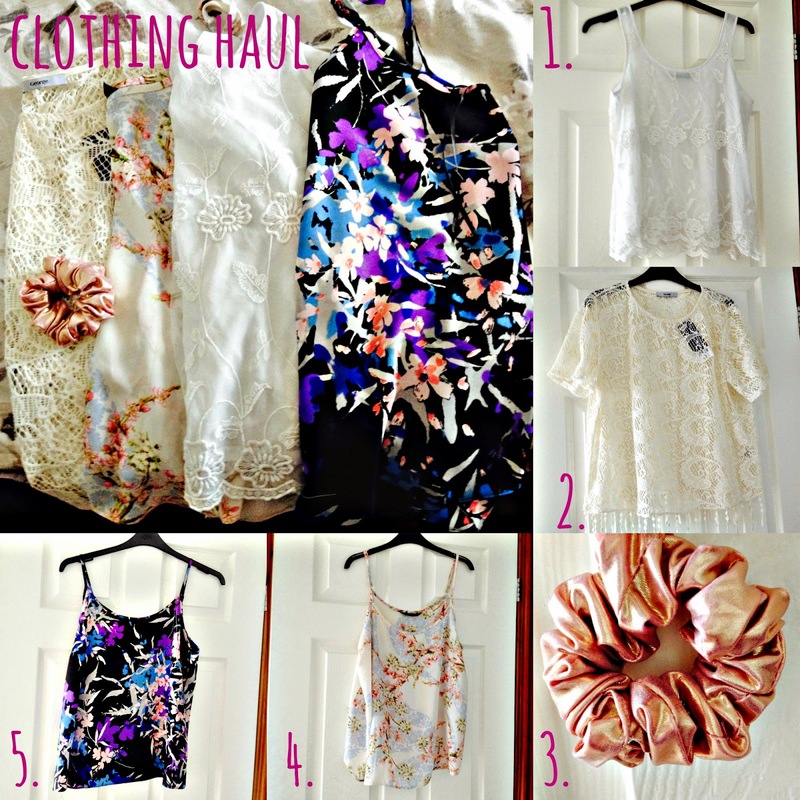 Today I have for you a small clothing haul.. woo! Recently I've been browsing very few shops but stopped into both Dorothy Perkins and ASDA (George) and found a few items that I liked and I thought I would share it with you guys. 1. White Lace Embroidered Vest - Dorothy Perkins for £20 when I bought it but is now in the sale for £18. 2. Crochet Fringe Top - ASDA/George for £8. I bought this thinking it would be perfect for a festival that i'm going to in August but would also be good to wear over bikinis on holiday or bandeaus. 3. Hair Scrunchie - ASDA/George for £3. I bought this metallic pink scrunchie from an ASDA store sadly they don't stock them online, however they do have a range of them when I last visited. 4. White floral Cami Top - Dorothy Perkins for £18. This is sadly not online anymore but may be stocked in some stores... but here's a link to their cami tops online. 5. Floral Print Cami Top - ASDA/George for £6. ASDA had a range of cami tops that I've seen in store and I picked this one up instead of a simple lilac one for a quid more. That's all for my small clothing haul. Let me know in the comments or @emilyhan1395 if you liked this post or links to your clothing hauls would love to read them. So back in December 2011 when I was browsing through the MAC in Heathrow airport I found the love of my life. Ok maybe not love of my life but my favourite foundation to date. 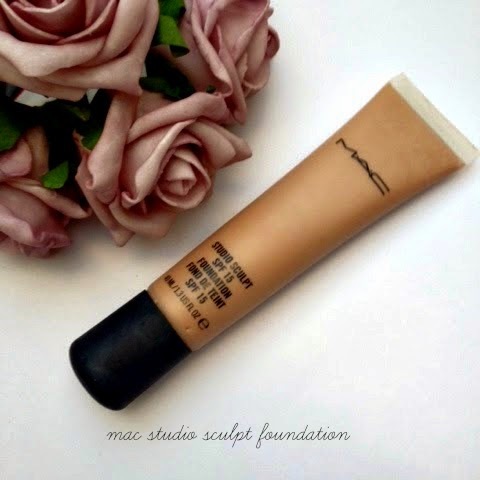 MAC Studio Sculpt foundation. I was so eager to get my hands on a mac foundation as I had heard great things on them and since that time I haven't looked back. I haven't got the best skin and therefore for that reason I like a foundation that is medium to full coverage in order to hide my imperfections aka redness and acne... and this product does just that! The foundation: This foundation comes in at least 20 shades and can be bought from either MAC online or a airport/department store e.g. House of Fraser or Debenhams depending whether stocked there. It costs around £25 pounds and you can usually get matched by a makeup artist so there's no worries about getting the wrong shade or if buying online I recommend using foundation comparison sites such as findation. I was matched to NW20 and this matches my skin perfectly and last's pretty much all day. I find that it last's a good amount of time (6 months at least) making it worth every penny for me. tip - cut the top of the tube when running low or struggling to get the foundation to come out. You'll be surprised by how much is left if you are like me. This foundation is a creamy texture and gives a great coverage as it's medium to full coverage and easy to blend. I love it as it covers all my insecurities as stated above and provides me with confidence. The packaging for me is a great thing! I love the simple squeeze tube rather than a pump and glass bottle. This packaging also helps with getting the most out of it as you can simple cut the top and get what's left inside out. No wasting product. Let me know about your favourite foundations in the comments below or @emilyhan1395 or about any MAC products you would recommend, we'd love to hear from you guys.